As you know, I love stir-fried pumpkin!! I created a recipe last year and still love it to pieces. Do check out my stir-fried pumpkin with eggs! This year, I stir-fried the pumpkin with yellow noodle or lo mein. Can you spot the pieces of pumpkin on my noodle? It went so well together too. Again, I had some yellow noodle left, not enough to feed my hubby, so I cooked it for my girls and me for lunch. Sorry hub, you had to miss out on this yummy. :P This was one colorful dish too, I added in all the colors I could think of. I would love to share my Lo Mein Pumpkin with Presto Pasta Nights created by Ruth and this week host is Simona of Briciole. Check out her blog on Friday for the full roundup! 1/3 -1/2 skinless and boneless chicken breast, thinly sliced and marinated with Chinese cooking wine, soy sauce, white pepper, sesame oil and cornstarch. 1. Prep all the ingredients. 2. Heat up the wok. When heated, add in cooking oil. When hot, add in garlic and chicken breast. Stir-fry until chicken is cooked. Add in pumpkin, stir-fry until pumpkin is soft. 3. Add in red bell pepper and carrot, stir-fry well. Add in lo mein, stir to mix well. 4. Add in all the seasonings. Mix well. Lastly, add in bean sprouts and scallion, stir quickly or until bean sprout is cooked. Do a taste test to see if it needs more seasonings. Adjust accordingly. Serve hot! You reminded me that it has been some time since i participated in pasta presto!! This looks filling and delicious with pumpkin! ohhh love the use of pumpkin here! you're creative as always! I'm loving your stir fried pumpkin - may need to try this - especially with the lo mein...perfectly done. You are so creative. I love pumpkin but sadly both hubby and daughter don't like them. I always love to see pumpkin in my food. This is a great one-dish meal. Pumpkin is my favourite vegetable. I also like lo mein. I actually haven't tried it until I went to USA! I have never tried to stir-fry a pumpkin, so now you made me curious to try. You plate of Lo Mein looks very inviting. 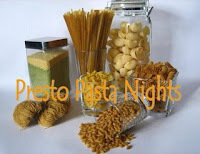 Thank you so much for contributing to Presto Pasta Nights. I've never thought of using pumpkin this way and your noodles look really delicious! very creative idea!! :) looks delicious! I had try vegetarian version of meehoon with pumpkin, but yet to try with noodles, sound yummy too.